Climate Change May Be Destroying World's Oldest-Known Mummies : The Two-Way The Chinchorros, who lived between modern-day Peru and Chile, mummified their dead at least 2,000 years before the Egyptians. But some mummies have begun to turn to ooze, so scientists investigated. A mummy of a Chinchorro child, dating to between 5000 B.C. and 3000 B.C. The Chinchorros were hunter-gatherers who lived in the region between modern-day Peru and Chile. There's a problem with the mummies at the University of Tarapacá's archaeological museum in northern Chile. They're turning into a black oozy substance. 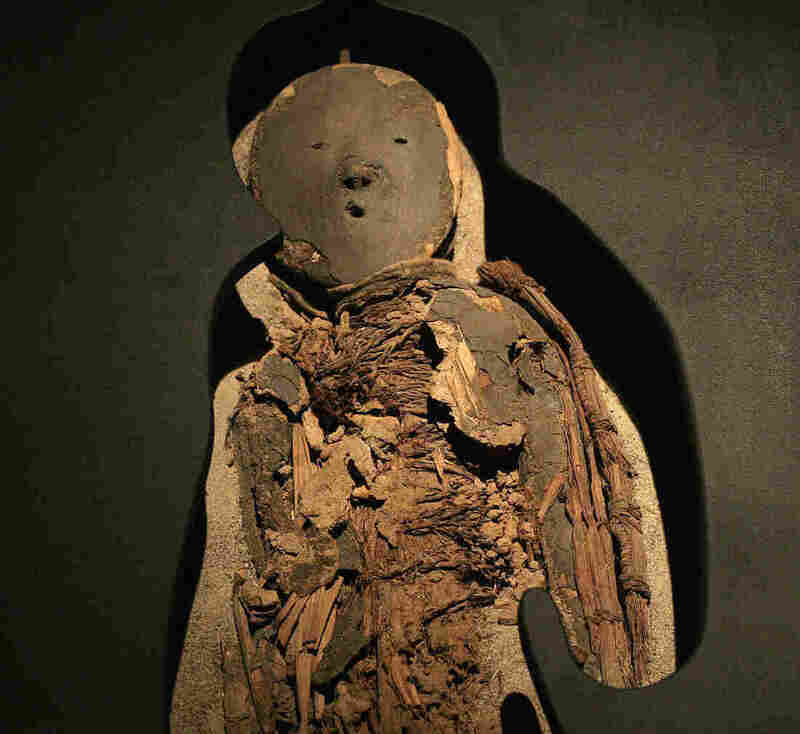 Harvard University's School of Engineering and Applied Sciences says scientists have found that Chile's famous 7,000-year-old Chinchorro mummies are being eaten by bacteria — and that climate change could be the culprit. Nearly 120 mummies housed at the university's museum near the city of Arica are affected. The Harvard researchers were called in to examine the rotting mummies and found that the region's increasing humidity is allowing microbes to flourish. A Harvard press release quotes one of the scientists, Ralph Mitchell, as saying that "we knew the mummies were degrading but nobody understood why. This kind of degradation has never been studied before. We wanted to answer two questions: what was causing it and what could we do to prevent further degradation?" Archaeologists note that Arica is extremely dry (it's located near the Atacama Desert, one of the world's driest deserts) but the humidity levels in the region have recently risen. Higher humidity means microbes are breaking down the Chinchorro mummies, essentially turning them to goo. "In the last 10 years, the process has accelerated," Marcela Sepulveda, an archaeology professor at the University of Tarapacá, tells Harvard. The Chinchorros were hunter-gatherers who lived in the region between Peru and Chile. They had elaborate mummification processes at least 2,000 years before the Egyptians developed theirs. As NPR has reported, climate change might have led to the Chinchorro mummies' longevity in the first place. The desert area where they lived was so dry that dead people became mummified naturally. Archaeologists have found that the Chinchorros actually began the practice of preserving their dead during a time when the climate was more humid, so there was abundance of food and free time to spend on developing mummification techniques.